We're a little over a month away from the National Foundation for Celiac Awareness's Appetite for Awareness event, and more vendors have signed on for the festivities. Area gluten-free bakeries Amaranth and the Grain Exchange will be there, as will perennial favorite Shabtai Gourmet and newcomers such as Plum Catering, Bye Bye Gluti and O'Doughs. The first 200 people to purchase from the NFCA store will get goody bags filled with products from companies such as Cookies For Me, Blue Diamond Nut Thins, Lucy's and Mary's Gone Crackers. This week I chronicled our recent summer vacation to Toronto, Niagara Falls and Cooperstown. Reader Jamie Y. shared some out-of-town restaurant recommendations of her own. During a recent trip to Washington, D.C., she and her family dined at several eateries owned by Chef Jose Andres, who popularized the small-plates concept in the United States. His Jaleo (Spanish), Oyamel (Mexican) and Zaytinya (Mediterranean) restaurants all have gluten- and nut-free menus. She also suggests a stop at Red Velvet Cupcakery. Center City Philadelphia has another spot where gluten-free diners can enjoy pasta. Le Castagne (1920 Chestnut Street, 215-751-9913) offers gluten-free gnocchi, but it's not listed on the menu so request it from your server. The kitchen can also accommodate in the preparation of other items. Suburbanites can get gluten-free pasta at Mina Cucina Rustica in Spring House (805 North Bethlehem Pike, 215-641-1180). In Rosemont, longtime neighborhood staple Gullifty's (1149 Lancaster Avenue, 610-525-1851) has added a gluten-free food and beverage menu. Grab a bowling ball, bites and beer - just not all at once, please - at North Bowl in Philadelphia's Northern Liberties (909 North 2nd Street, 215-238-2695). Among the menu items are gluten-free Mac & Cheese and Cheese Burger Mac as well as Redbridge. J.B. Dawson's first Delaware location is set to open October 13. The restaurant is at the Christiana Mall in Newark near Nordstrom, Apple and Anthropologie (315 Christiana Mall, 302-369-4000). The chain, with Pennsylvania locations in Drexel Hill, Langhorne and Lancaster (and sister restaurant Austin's in Reading) has an updated gluten-free menu that includes gluten-free pasta dishes and mac & cheese for the kids. Earlier this week, P.F. 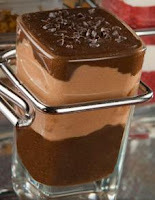 Chang's China Bistro officially added to its dessert menu a new gluten-free Triple Chocolate Mousse Mini, a combination of chocolate ganache, milk chocolate mousse and flourless chocolate cake. We tried this a couple weeks ago and it is sinful! The chain has local Pennsylvania outlets in Collegeville, Glen Mills, Plymouth Meeting and Warrington and in Atlantic City, Marlton and Princeton, New Jersey. Philadelphia Inquirer columnist Michael Klein reports that European bakery-cafe Le Pain Quotidien is coming to the 1400 block of Walnut Street in Center City. The chain's stateside outposts serve a Six Vegetable Quiche, made with artichokes and garden veggies on a gluten-free buckwheat crust. Ninety Nine, a casual American restaurant chain with spots in Audubon, Northeast Philadelphia, Trevose and Warrington, Pennsylvania and Deptford, New Jersey, is supporting charitable organizations through its "Dining for a Cause" program. Apply to host a fundraiser at any location and the restaurant will donate 15% of sales from supporters back to the designated organization. The restaurant offers a varied gluten-free menu, including burgers on gluten-free buns. I'd be happy to spread the word about any local fundraisers organized by readers that support the NFCA, local hospitals' celiac disease centers or similar causes. The Fenix Bar in Phoenixville (193 Bridge Street, 610-933-955) has Redbridge on its bottled-beer menu. A postscript to last week's item on the limited-release pumpkin cider from Woodchuck. On its Facebook page, the company posted a list of cities where the cider will be sold. No towns in Pennsylvania or southern New Jersey are on the list. If you're in or near Delaware, though, you're in luck: package stores in New Castle, Wilmington and Newark are slated to get it. 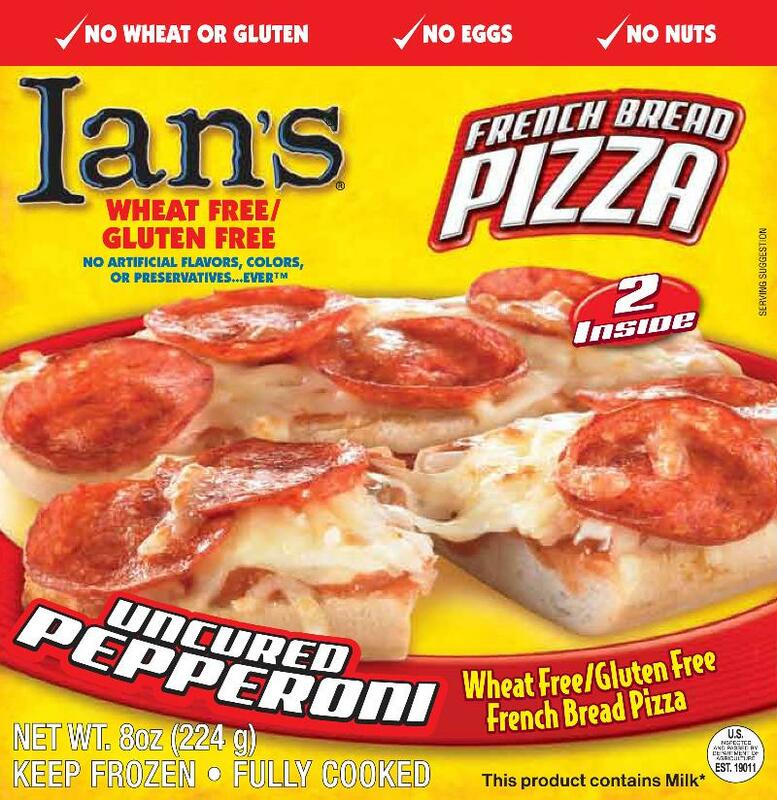 Ian's Natural Foods has announced two new gluten-free products: chicken tenders (also free of dairy, soy, eggs and nuts) and french bread pizza with pepperoni (egg- and nut-free). The Gluten-Free Supper Club will meet this month over dinner at Adsum, in Philadelphia's Queen Village neighborhood. The meal, on Tuesday, September 21 at 7:30 p.m. will feature three courses (two choices per course) for $35 per person exclusive of alcohol, tax and gratuity. For more information or to be added to the reservation, e-mail reader Adriana Z. After a summer respite, Gluten Free Delaware resumes its support group meetings next month. The next meeting is planned for Sunday, October 3 at 3 p.m., to be held at Christiana Hospital in Newark, Room 1000. 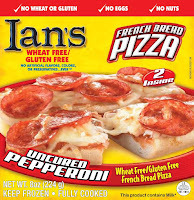 I picked up those Ian's Pizzas last week. I noticed on the back that the crusts are actually made by Glutino. I will probably eat one this weekend and will definitely report back.